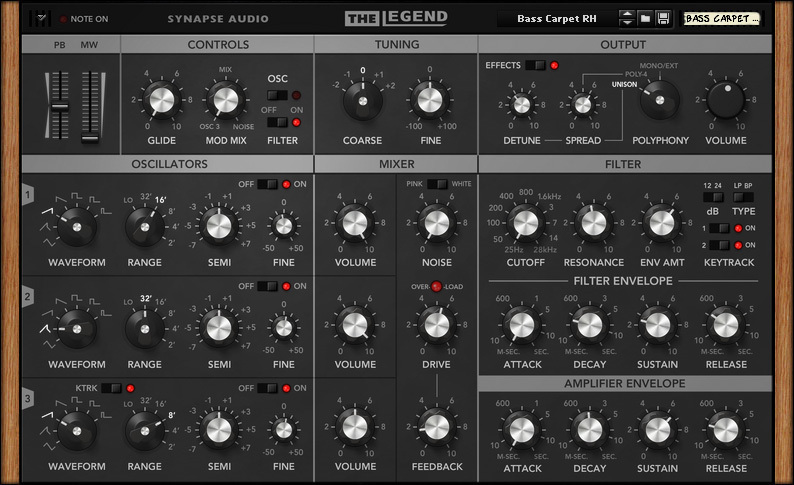 The Legend is an analog-modeling synthesizer plug-in, faithfully recreating the most iconic synthesizer of all times. Developed in cooperation with the vintage synth specialists at Bigtone Studios, The Legend marks new territory in analog modeling technology. Every component, ranging from the voltage-controlled oscillators (VCOs), voltage-controlled filter (VCF) and voltage-controlled amplifier (VCA), have been modeled to an accuracy never seen before in software. Furthermore the snappy filter and amplifier envelopes have been meticulously modeled, as well as the massive bottom end - even the most marginal effects like temperature drift or effects originating from the power supply have been taken into account. On top of all this, The Legend offers additional controls not found on the original hardware, greatly enhancing its already impressive feature set. The most significant additions are the Unison and Polyphonic modes, allowing for fat stereo sounds, as well as enabling polyphonic play. Built around a vectorized core, The Legend is capable of synthesizing four voices for the cost of little more than a single voice, making it one of the most efficient analog-modeling plug-ins available today. A bonus feature of The Legend is its on-board effects, comprising a high-quality delay and reverb unit. 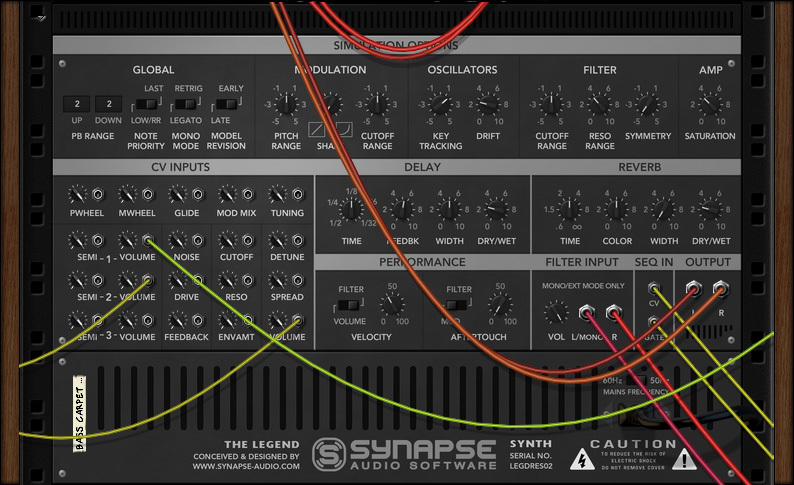 Both effects are tailored to the needs of the synthesizer, and offer perfect sound with just a few parameters each. The back panel offers a whopping 20 CV inputs to control most sound parameters, a sequencer input for CV/Gate connection, and an external filter input to process mono and stereo audio signals with The Legend's high-quality filters. The Legend comes with 480 patches crafted by leading sound designers and sorted into common categories like Bass, Lead, SFX, etc. The patches comprise both new sounds and a large collection of vintage sounds as found in famous classic recordings. New bandpass filter added with 12dB and 24dB slopes. Support for Velocity and Aftertouch on the back panel. Factory library extended to 480 patches.